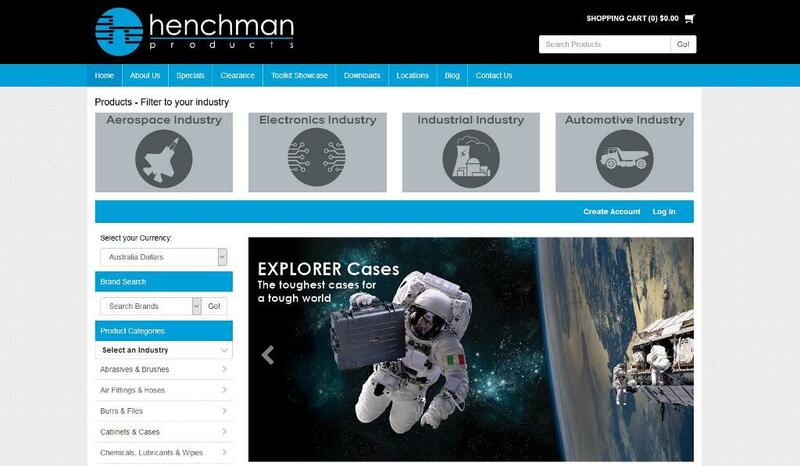 Henchman Products was established in the beginning of 1999 in Newcastle, Australia. Henchman has grown rapidly to cover the national market spreading into Melbourne and expanded globally with branch offices in New Zealand, Dubai and Singapore. "We approached Straightsell as our current supplier could not satisfy our core requirement, which was to have an industry specific navigation and product display all located in a single website rather than divided into the four websites we had. Straightsell did not not consider this an issue at all and quickly finalised a comprehensive and costed scope to satisfy this requirement. This gave us confidence that all of our additional requirements would be dealt with in the same efficient and transparent manner, and they were! The team at Straightsell were easy to work with throughout the project and we are very happy with the end result, the site looks great and meets all of our customer needs."